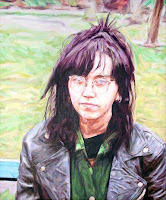 An old portrait of a past girl-friend in the "three-quarters of a yard" size. Looking at the painting now, her hair should have been painted with a more intense purple colour. I also remember how much I hate painting black leather with all the reflected colours.